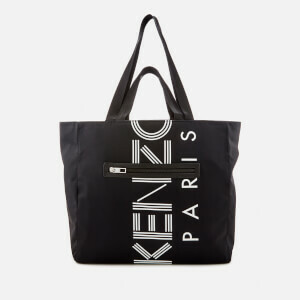 Showcasing KENZO’s urban and sporty spirit, the men’s black ‘Sport Logo’ backpack from the eclectic Parisian fashion house features a roomy interior access by dual-way zips. A large zipped pocket within and a zipped pouch at the front offers additional secure storage. Padded shoulder straps offer all-day comfort and can be adjusted in length. Crafted from durable nylon adorned with a contrast logo print, the rucksack is accentuated with polished silver-tone zip pulls and leather trims. A top handle and cushioned base add the finishing touches.